Stuffed Chicken breasts are one of my favorite meals to make for company. They are really easy, the prep work can be done in advance, and they are beautiful! 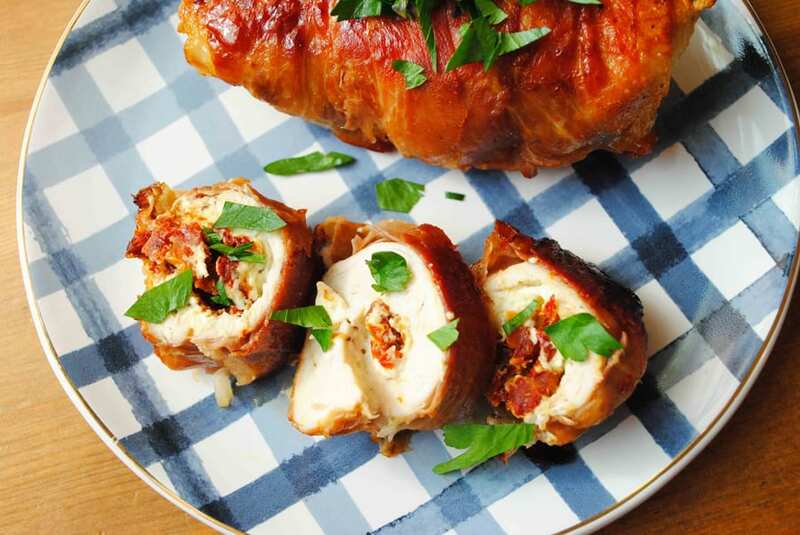 These chicken breasts are stuffed with creamy goat cheese and sun dried tomatoes then wrapped in thin slices of prosciutto. The end result is simply stunning and so very tasty. I’m really into mixing my goat cheese with cream cheese to add extra creaminess to it. 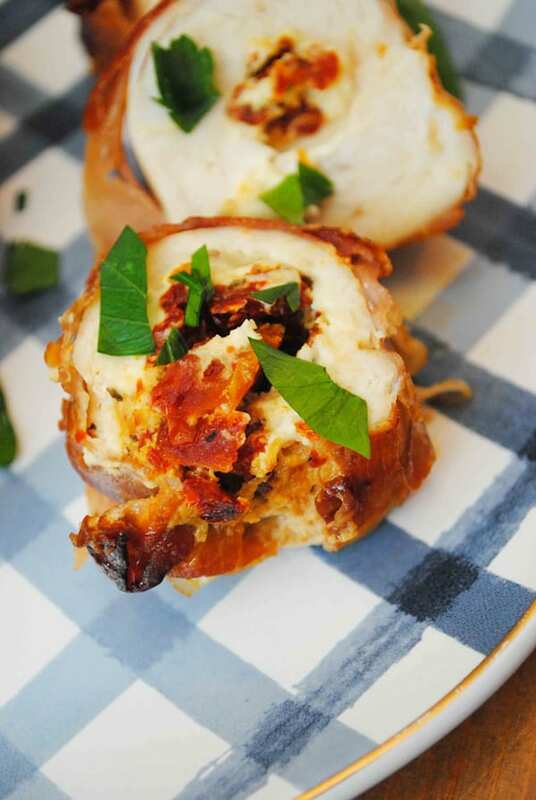 Goat cheese alone stuffed in a chicken breast makes everything sort of dry on the palette. Cream cheese helps to combat that. The sun dried tomatoes are found in a jar where you get canned tomatoes in the grocery store. I prefer to buy the already cut up ones to save time but halves are fine too, you can easily cut them at home. I like mine packed in olive oil and herbs for additional flavor. 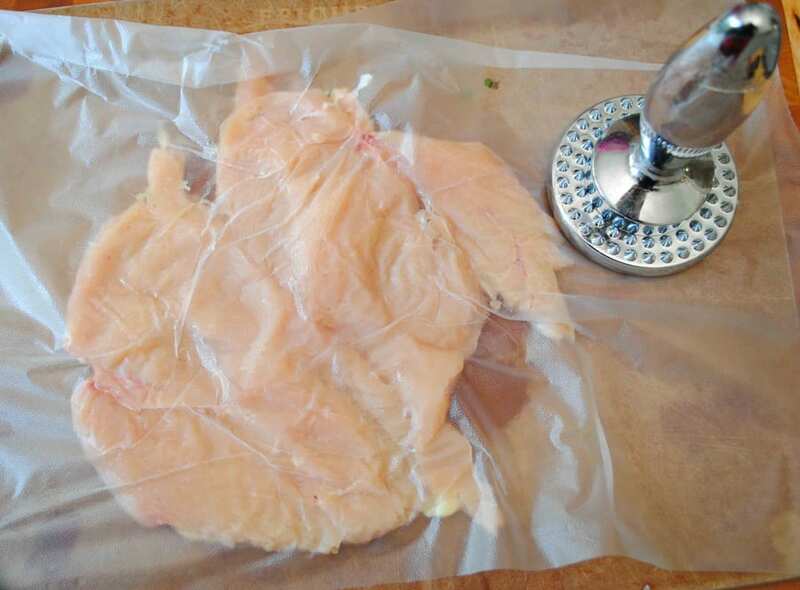 To flatten your chicken you can easily do it with a rolling pin if you don’t have a meat tenderizer. My very favorite meat tenderizer is the Leifheit Reversable Side one. You can see it on Amazon with my link: http://amzn.to/2zeuOGm I love that the handle can screw off the base and I clean it all in the cutlery part of my dishwasher. Admittedly I’ve never used the teethed side, but this one has a great heavy weight to it which I find requires less work on my end. Check out my instructional pictures at the bottom of the recipe to see how to assemble the chicken. It’s really easy. And if you have company coming over you can assemble these chickens then leave them in the fridge until you are ready to cook. It makes entertaining a breeze. I pound my chicken by sticking it in a gallon size plastic bag that I leave open, or under a piece of plastic wrap on a cutting board. I lay the chicken flat then use my meat mallet to pound it flat. Pull the chicken out an continue with the next piece until all four are about 1/4" thick. Place 2 TBSP cheese on one chicken breast. 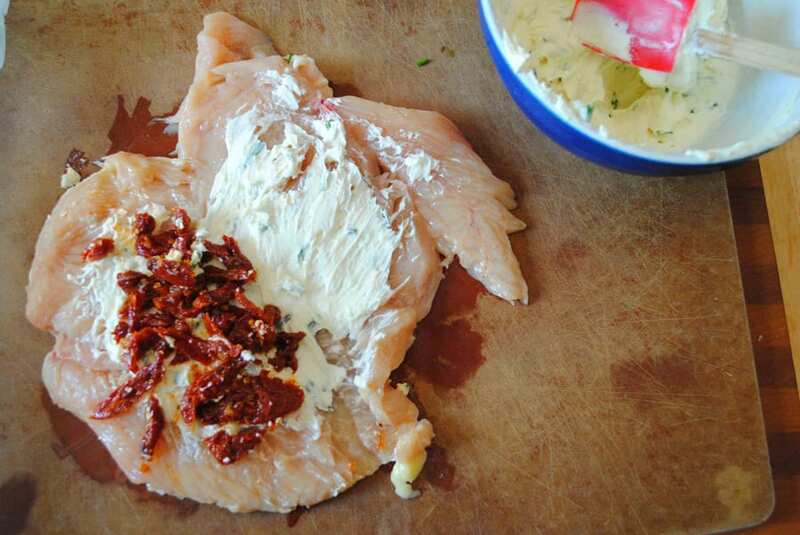 Spread the cheese mixture on the chicken breast so that it is evenly distributed. Leave a 1/4" border on the edge of the chicken so extra cheese doesn't leek out when the whole thing is heated. On one short edge of the chicken place 1 tbsp of the sun dried tomatoes. Starting on the side, roll the chicken up. 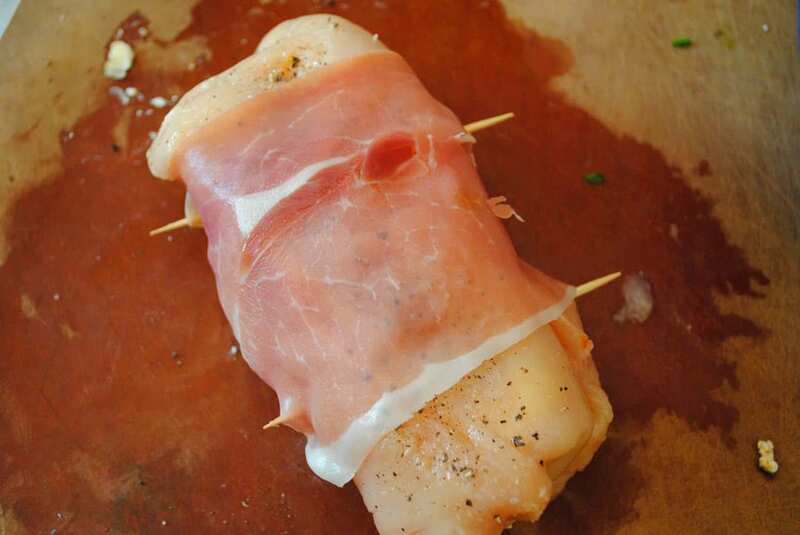 Wrap 1 slice of prosciutto around the rolled chicken breast. I like to have my seems meet on the bottom side of the chicken breast, where the seem is from rolling it up. Insert two toothpicks into the chicken breast to hold it all together. Heat an oven proof non stick skillet over medium high heat. Add in 1 tbsp olive oil. Then place your chicken breasts in the pan. Brown on each side for about 4 minutes or until they get a nice brown color. Place the pan in the oven and bake for 25 minutes or until the chicken is cooked through. I like to flip my chicken half way so that both sides get a nice deep caramel color. Pull the chicken out of the oven, and carefully remove the toothpicks. I let everyone cut their own chicken on their plate. That way any goody that oozes out at the end, can be sopped up with the breast.